Osun Village, for seniors on Grays Ferry Ave. Dignitaries at the ribbon-cutting Monday lauded the added low-income housing. Lois Fernandez works in visions. It was during a pilgrimage to Nigeria in 1972 that she first imagined the Odunde Festival, Philadelphia's celebration of African culture that she founded in 1975. The circumstances of her other great vision were more humble. Sitting in Odunde's "raggedy" office at 2308 Grays Ferry Ave. in the late 1990s, the longtime activist/agitator noticed that termites were eating her building. She looked outside the window, saw empty parcels next door, and told herself: "We can build." With the same impulse that propelled Odunde - that African Americans are a vital and proprietary component of this city - she determined to construct a place where seniors could live without leaving their neighborhood. 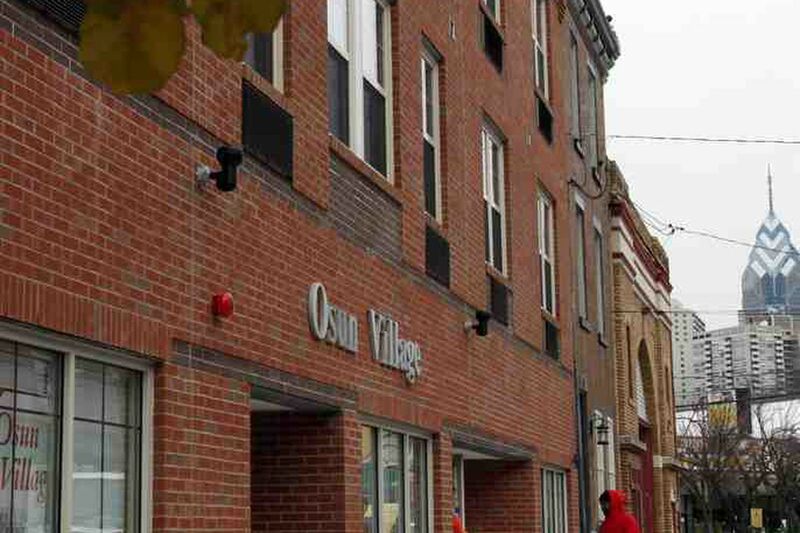 On Monday, that vision materialized with the opening of Osun Village, a $4.7 million, four-story complex with 16 one-bedroom apartments for low-income seniors in the section of South Philadelphia known as Schuylkill or Southwest Center City. One of those seniors will be Fernandez. It was an effort 13 years in the making, from concept to proposal to financing struggles to neighborhood conflict to fruition. Named after the goddess of love and beauty in the West African Ifa religion, it includes $1.5 million in city block grants, $750,000 in federal stimulus money through the Pennsylvania Housing Finance Agency, and $79,000 in economic-development funds from the U.S. Department of Housing and Urban Development. The dignitaries who appeared to cut a ribbon Monday lauded the addition of affordable-housing units, but they were also there for "Miss Lois," the 74-year-old visionary with a saintly smile and a South Philly swagger. "This is a tribute to Lois Fernandez," said Kenny Gamble, whose Universal Companies partnered with Fernandez on the project. "This would never, never have become reality without the constant, constant persistence of Lois Fernandez," said City Council President Anna C. Verna, one of the many officials who have felt the weight of the wispy woman's will. These days, Fernandez's rheumatoid arthritis has more than hobbled her - after two knee replacements, she nearly died following her second hip replacement last year. She uses a wheelchair most of the time. But she rarely stops swinging. She has fought her neighbors to keep the Odunde Festival on South Street. She and Universal Companies wrangled with neighbors and merchants in court about the new building's height. She wanted six stories; she got four. In an interview last week, Fernandez was both grateful and feisty, recalling her conflicts with "the gentrifiers." "I got my South Philly," she said, referring to the take-no-grief character of the neighborhood she grew up in, where blacks, Italians, Irish, and others lived, fought, and survived. "Either we peacefully coexist, or we war." But those battles are done, at least for now. "This is the home of love for our seniors," Fernandez, beaming, said Monday. "Look at it - it's beautiful," Wendy Jacovic, owner of South Square Hardware, said last week. Jacovic was a one of those neighbors who fought the partnership over its design and likes the negotiated result. "It looks like it's part of the neighborhood," Jacovic said. Fernandez' 36-year-old daughter, Oshunbumi T. Fernandez, now runs the Odunde Festival. On Monday, she described the significance of being her mother's daughter. "It's like looking for freedom," she said, "and you got Harriet Tubman as your leader." The building takes up four lots on the 2300 block of Grays Ferry Avenue, near the intersection with South Street. One lot was Odunde's original office, two vacant parcels were obtained through the city's Neighborhood Transformation Initiative, and the partnership purchased a fourth. The space includes two commercial storefronts that are not yet rented, and it will have a space for Odunde's office. It will also offer a home for Fernandez, a retired social worker for the city's Department of Human Services. State and city officials said Fernandez met the qualifications to live in the complex, which targets seniors making less than 50 percent of the local median income of $27,450. It was advertised in the South Philly Review and on the outside of the building. Rent is set on a sliding scale. Four units are still available. Tamelia Hinson, Universal's executive vice president, said Fernandez met the project's income requirements. "She had to apply like anyone else." Mayor Nutter described Osun Village on Monday as "the kind of place I would have liked my grandmother to grow old in." Rahim Islam, president and CEO of Universal Companies, said he was gratified to take part in Miss Lois' "last hurrah." "She's been a part of the struggle for the African American community for so long," he said. "I'm glad to be part of her vision for South Philadelphia."